It's not often that I feel like having made a wonderful discovery, but this is one of those cases. Having tried just about every brand of toothbrush available, I can say with confidence that, for us, this is the best one yet. We generally buy Oral-B or Sensodyne, choosing the softest type of bristle and the smallest head shape but, without fail, within 2-3 weeks the bristles lose their shape and become sharp and much less effective. So their pristine condition lasts a very short time. We have been using the first two of this set of five charcoal toothbrushes for 2 weeks straight and there is no sign of deterioration at all. Since the tips taper to a much finer shape than I'm used to, I expected the opposite. The handles have a nice rubbery feel that makes them very easy to hold. 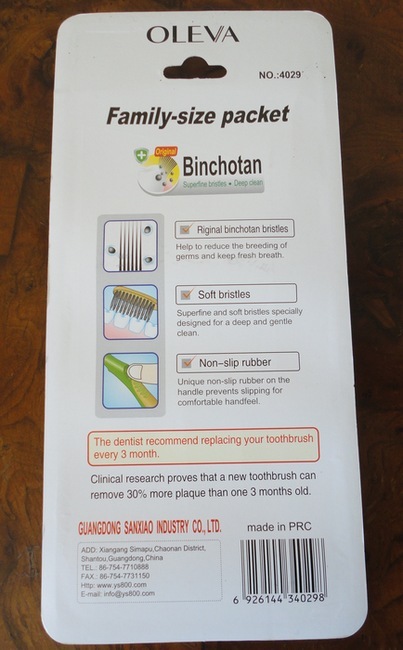 I have also noticed that, without doing anything different, the cleaning action is much smoother and the results much better than with regular toothbrushes. The proof is that when I use my Waterpik after brushing, there is hardly anything left behind to remove. 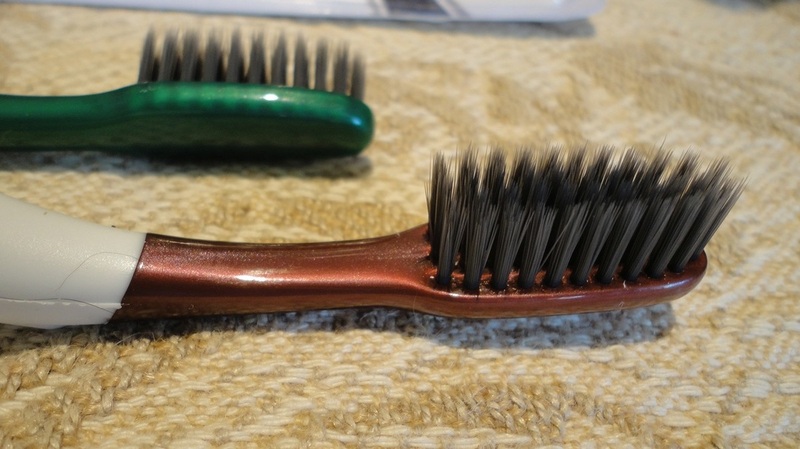 The bristles reach deeper between the teeth but the contact remains soft. The antibacterial effect of the charcoal also makes my mouth feel fresher. Binchotan charcoal is obtained by carbonizing oak branches in high-temperature kilns. The resulting fibres release negative ions, and are said to remove plaque and so reduce bacteria. 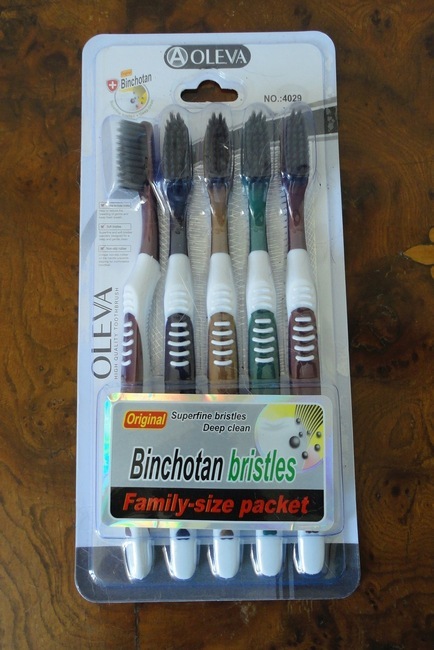 I will update this review to indicate how long each individual brush lasts, I am actually very curious myself. The last wonderful surprise is the price. With five in the package, this is great value for money. Oh, and being totally superficial for a moment, I rather like the black bristles, they look great in our bathroom! 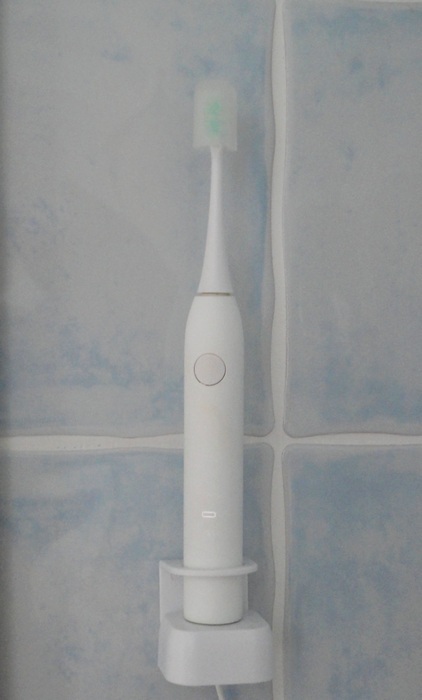 This is my first electric toothbrush, although we have been using other oral care devices like a Waterpik for years. I was curious to see whether I would actually want to use it past the test period. The vibration against lips and gums takes a little while to get used to but is not at all unpleasant. 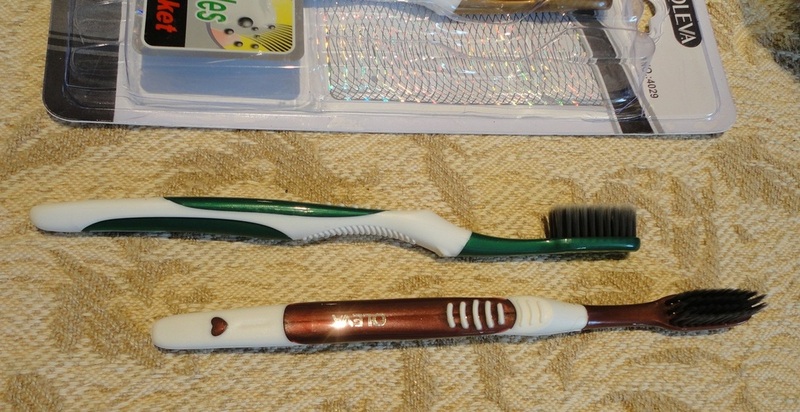 The body of the toothbrush is smooth but easy to hold and operate with one hand. 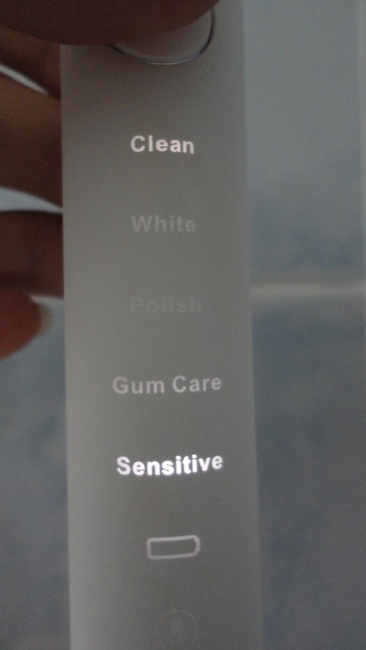 There is a sequence of five functions which feel slightly different and are labelled as Clean, White, Polish, Gum Care, and Sensitive. These can be combined into 15 modes, using different functions to customize the sequence; it does sound a little complicated but the manual explains it all. For now, I have found that just using it in default mode does the job for me. A single button starts the vibration; every 30 seconds a beep heralds a short pause, during which you have a chance to move the brushing head to a different section of your mouth. The full cycle takes 2 minutes; it certainly feels a lot longer than I would normally spend brushing my teeth, so just the timer thing makes my oral hygiene more thorough. 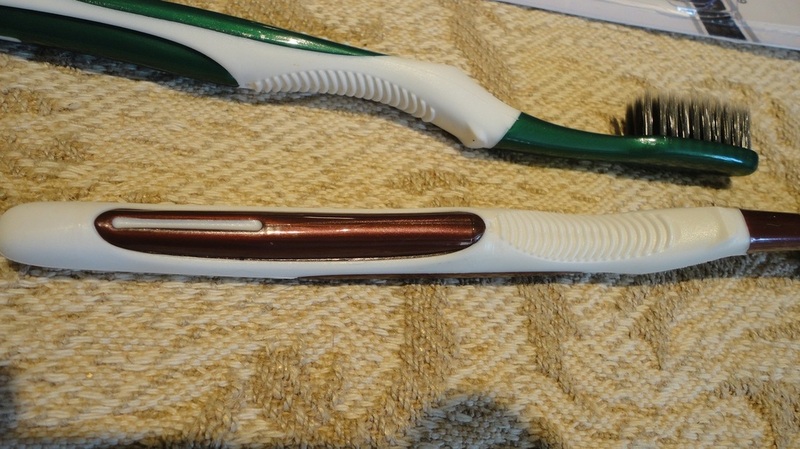 Two toothbrush heads are provided, medium-soft in texture. Since they are both the same colour, I have placed a spot of nail polish on the stem of one to distinguish between them, so two of us can share the same handle. Also included is a neat charging holder with a USB plug (ideal for travel), an adapter for a wall outlet, and a piece of strong 3M sticky foam for attachment to the wall. 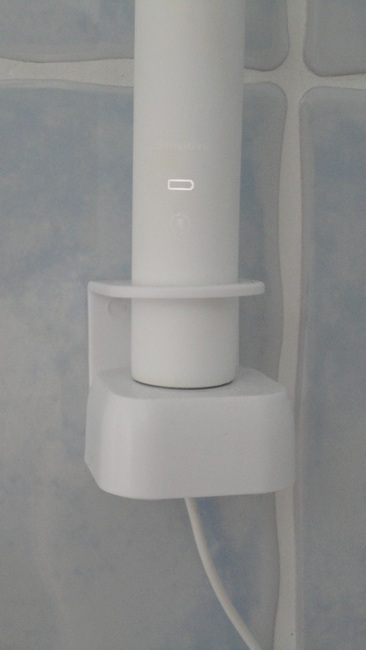 The charger has adhered very solidly to the tiles in my bathroom and provides a handy perch for the toothbrush. I say “perch” because the toothbrush body wobbles a bit while it is sitting in the holder, being recharged, or simply stored there. Not the most secure arrangement I've ever seen, but no falls yet. 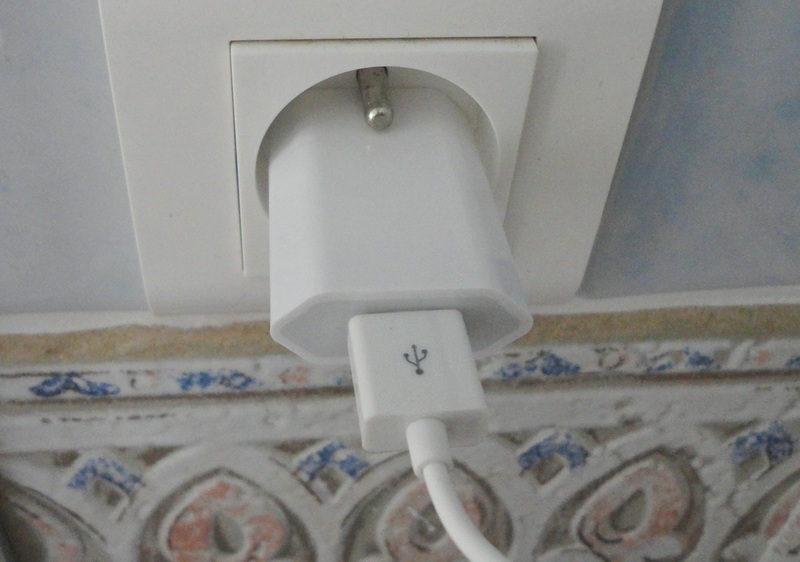 You can keep the charger plugged in all the time without shortening the life of the battery, but this is not necessary. The autonomy is very good, stated as 16 days based on a daily use of 10 minutes. Since my unit is plugged in most of the time, I have not verified how long a single charge lasts. After only a couple of days, I felt very comfortable using this electric toothbrush. After a test of two months, I'm very pleased with the quality and ease of use and the whole unit looks kind of cool in my bathroom. I love the very smooth feel of my teeth after the sonic brushing and I've noticed that my gums are particularly pink and healthy-looking, so I will certainly continue with this newly-acquired, good habit.